Pretoria Boys High School can trace its origins back over more than 110 years. During the Anglo-Boer War (1899-1902), the city of Pretoria was captured in 1900 by British forces under Lord Roberts and the Transvaal became a British colony. One of the responsibilities of the colonial administration was to re-establish schools as these had all been closed during the hostilities. Although the war continued to be fought by the Boers as a guerrilla conflict, moves were made to start a school in central Pretoria and Charles Hope was brought up from the Eastern Cape to undertake this task. Hope had to establish a school virtually from scratch as he tried to source everything from desks to teachers. Explore the history of Pretoria Boys High School and take a tour of our school museum. The museum can be visited during school term between 09:00 and 12:00, Monday to Friday. To arrange a tour please complete and submit the form below. 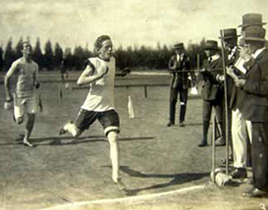 Early sporting activities at the school included cricket, rugby and athletics, with the English public school tradition showing in pursuits such as paper chases, a form of cross-country racing. Athletics meetings included quaint events such as “throwing the cricket ball” and egg-and-spoon races! The school's only Nobel Prize winner (and South Africa's first), attended PBHS in the first decade of its existence. Max Theiler (son of Sir Arnold Theiler), received his award for research on the origins of Yellow Fever. In 1914, work was begun on a third boarding house named School House. Completed in 1915, it was, until 1990, traditionally the home of the headmaster who acted as senior housemaster. The First World War (1914-18) saw a significant number of old boys and masters volunteer for military service and they served in South West Africa, East Africa and Europe. In 1929, a memorial to honour the twenty-eight men who had perished in the war was added to the main building, somewhat altering its appearance. It consisted of a plinth with names above the main entrance, an eternal flame, a clock above the memorial and bells in the east tower that chime the Westminster chimes. The 1920s saw PBHS absorb two smaller local schools, the White House School and a Commercial High School. The growth in numbers also necessitated the first expansion of the main buildings to accommodate additional classrooms. In an exercise that demonstrated amazing self-sufficiency, the school's first cricket pavilion and tuckshop was built in 1923 by school boys and masters during one of the school holidays, using materials almost all found on the property. This included the stone quarried on site and the thatching for the roof. Remarkably, the ground floor shell of this building survives today as the base of the present-day cricket pavilion on Hofmeyr Oval. 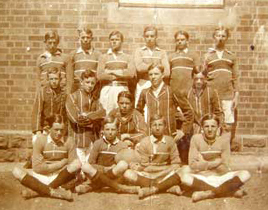 PBHS sports teams began to play schools further afield, including Johannesburg and Potchefstroom. When the Administrator of the Transvaal introduced a trophy for schools in the province playing rugby in a series of matches for what became known as the "Administrator's Cup". 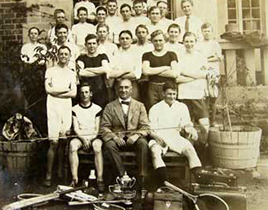 Boys High won it in the first three years (1922-4) of the contest and the school museum is today the custodian of the trophy. In 1934, a swimming pool was added to the facilities. Situated in the same spot as the present (much larger) pool, it was constructed after a major fund-raising drive and the selling of advertising, for the first time, in the school magazine. The "candle race", swum at the end of the annual inter-house gala, has its origins in the first years of the school pool.. The second headmaster (in the current buildings) was Mr Daniel Duff Matheson, appointed in 1935. A Scotsman with a great passion for golf, his attitudes to then common practices such as corporal punishment, were remarkably progressive for their day. "Baldy" or "Garibaldi" as he was known, became a much-loved headmaster in his day. The first school musical production was staged in 1938 under the direction of Elwyn Davies. It was the Gilbert and Sullivan operetta "The Mikado" which set the pattern for decades to come. In the first years of annual productions, a temporary stage was erected until it eventually became a permanent fixture. The outbreak of the Second World War had a major impact on the school. Many matric pupils and a number of teachers volunteered for military service. Consequently, a shortened matric year was introduced in some years and the first women teachers were employed to make up for staff shortages. Rationing of certain items (including paper), fire fighting drills and blackout curtains were all features of this period. The political divisions within South Africa were also evident in incidents such as the petrol bombing attack on the cricket pavilion by members of the Ossewa Brandwag. The school's cadet programme (Cadet Detachment 141) provided a grounding for those who volunteered for military service immediately after high school. Several hundred past pupils and masters served in the armed forces of South Africa and Britain. At least 38 were decorated for Distinguished Service and 95 made the ultimate sacrifice. A second war memorial was added in the foyer of the main building in 1954. In October 1948 disaster struck when a workman, busy with the renovating of the school buildings, accidentally set light to the upper cupola of the main buildings with a heat gun. Despite the best efforts of the fire brigade, the wooden structure was gutted. A human chain of school boys saved most of the books from the library, which was at that time located below the main dome. For a number of years the top of the dome was simply blanked off with a flat slab. Fortunately for the school, an enterprising member of the Public Works Department, Mr EE Penzhorn, researched the original design and construction techniques of the 1908 design and then undertook the construction of a perfect replica. Concurrently, the school's colourful art master, Walter Battiss, decided that the new upper cupola should be adorned with something more interesting that a flagpole. He arranged for a group of art boys to carve a life-size statue from wood depicting a naked young boy holding, in his hands, a book and a rugby ball. The pupil who posed for the work was Danny Swart and it was his name, which became linked to the statue, which was duly hoisted into its position above the dome. The symbolism of this statue since replicated in a number of miniatures, is important in that it reflects one of the core values of the school, namely the merits of a balanced, holistic education.. In the early 1950s, the state expropriated the North-Eastern corner of the school grounds for an Afrikaans-medium primary school, Pretoria Oos Laerskool, which still occupies this site. The decades after World War Two saw a steady growth in pupil numbers and the school soon outgrew its classrooms and hall. An unfortunate decision was taken to demolish the original school hall with its barrelled roof and wood panelled walls. The construction in 1963-4 of a new larger hall on a north-south orientation, was part of a building programme that included new double-storey wings of classrooms behind the original main buildings. The headmaster who succeeded Mr Matheson was Mr Noel Pollock whose links to the school extended all the way back to when it was housed in the Staats Model School. A student of Latin and a musician, his term of office was relatively short. Today the lower campus of the school is named in his honour. He was succeeded by Mr Desmond Abernethy who had also attended the school. Remarkably, although attaining the senior position of a school inspector in the Transvaal Education Department, he opted to return to Boys High as headmaster. "Abe" with his Irish brogue, would become beloved of school boys in his time. As student numbers continued to grow in the 1970s, further classrooms were added on the eastern and western side of the "koppie". These were all prefabricated buildings and were meant to be a temporary measure, which could be removed when the school numbers shrank. However, the school continued to grow and these classrooms are all still in use four decades later! Further prefabricated buildings appeared on the north-west corner of the property as yet more land was temporarily expropriated to accommodate the Pretoria Art, Ballet and Music School (Pro Arte). In this period, a farm in the Lowveld near Waterval Onder was donated jointly to PBHS and AHS by an old boy, Alec Roberts. A joint trust administers the farm, which has been used by Boys High for Form IV camps, something initiated by Mr Armstrong. The 1970s also saw the facades of the original four buildings (the main building and the three boarding houses) declared a National Monument. A ceremony presided over by the then Minister of Education, Mr Piet Koornhof, took place in the front of main building in 1978. The 1980s, under the headmastership of Mr Malcolm Armstrong, saw several initiatives to beautify the grounds and upgrade the facilities. A lake was constructed (later named "Loch Armstrong") which became the most attractive portion of the grounds. The state constructed a school gymnasium, albeit to a design that was definitely not in keeping with the other architecture on the property! The most important project set in motion in this period (and completed in the early 1990s), was the construction of twelve staff houses, a headmaster's house, an administrative block in the main building and renovated boarding housemaster flats within the three boarding houses. This was the last project undertaken on the rand-for-rand scheme in partnership with the state. It provided an invaluable asset that contributed to a stable staff complement. Although the school made representation to the authorities to open its admissions to all races, these requests were flatly refused under the segregation laws of the time. Nevertheless, under an anomaly that allowed the sons of diplomats to attend the school, the first black pupil was admitted in 1981. He was Stanley Netshituka who was the son of a member of the Venda diplomatic staff in Pretoria. In 1990 Mr Bill Schroder became headmaster after a career in Cape education that included being the headmaster of Rhodes High School and Pinelands High School. Under his headmastership, the school grew to over 1500 pupils made possible, in part, by the expansion of the day houses from three to seven. To the original houses (Town, Arcadia and Sunnyside) were added Hofmeyr, Matheson, Abernethy and Armstrong houses, all named after previous headmasters. The school began to be run on a vertical division created through the structure of the ten houses. The three boarding houses were also expanded at this time, something made possible by the construction of a centralised dining hall and a centralised laundry. Other new facilities added in this period were the rugby pavilion, two additional sports fields, an artificial hockey surface and change rooms on Abernethy Field. The advent of de-segregated education after 1994, led to PBHS setting up a Pre-Form One Programme in part of the complex of buildings that had been signed over to the school when the Art, Ballet and Music School moved to Alphen Park. This unique initiative served as a one year bridging programme for many of the first black pupils admitted to the school. It was phased out after a few years. During the early 1990s, the Junod family made an offer of a farm in the Western Magaliesberg on condition that it be utilised for a bush school. After a pilot project, this came into operation for small groups of Form II pupils in three school terms. The present headmaster, Mr Tony Reeler, took up his appointment in July 2010 (succeeding Mr John Illsley who was acting headmaster in the interregnum period). Mr Reeler hails from the Cape where he held positions at Rondebosch Boys High as a deputy headmaster and Pinelands High School where he was headmaster for seven years. Named after Mr Desmond Abernethy, Headmaster of PBHS 1956-1973. This design is taken from Abernethy family crests. The lion symbolises strength and independence. The shepherd’s crook held by the lion refers to the biblical passage of the sheep lying down at peace with the lion. Named after the suburb of Pretoria. One of the original dayboy houses. This features the head of Minerva, Roman goddess of wisdom and learning (also of war, hence the helmet), which was part of the original crest of the Transvaal University College (later Pretoria University), both institutions with which Boys High has had strong connections. Also, Arcadia is an area that borders on Tukkies. Named after Mr Malcolm Armstrong, Headmaster of PBHS 1974-1989. Almost all crests in this family are a pun (play on words) on the surname. Punning is very much part of heraldry. This crest is an adaptation of the “strong arm” and includes symbolism associated with learning and education. There is also the symbolism associated with the expression “the pen is mightier than the sword”. Named after Mr William Hofmeyr, Headmaster of PBHS 1910-1934. This design is a variation of the family crest of one of the Hofmeyr families in the early Cape. It features elements of the original family crest, the helmet, winged plume and horseshoe (the latter a traditional symbol of good fortune). Named after Mr Daniel Matheson, Headmaster of PBHS 1935-1949. The thistle symbolises Matheson’s Scottish roots. Other symbolic significance: role of (other) families with Scottish origins in the history of Boys High and the Boys High Pipe Band. The swords represent the war years (1939-1945) during which Mr Matheson was headmaster. It also acknowledges the role of masters and boys in this conflict. Named after the Right Honourable Johan Rissik, Minister of Lands in the Government of the Transvaal Colony when the present grounds of Boys High were laid out. Hence the design is based on the idea of growth. the tree symbol features in the school badge. One of the traditional names used in many English public schools and older South African boarding schools. This uses an element of the Harrow school crest with which Boys High has certain links. The bound spears also have a symbolic connection to the Eendracht lion: many of the original pupils in this house came from the Eendracht School. The bound spears have a strong link to the original SA motto (Ex Unite Vires – “Unity is Strength”). The spears also symbolise the First World War – this house was completed in the year the war started and a number of masters and old boys of Boys High served in that conflict. Named after Sir Edward Solomon, Minister of Public Works in the Government of the Transvaal Colony when the present Boys High buildings were built. The castle is a traditional symbol of building and an obvious symbol of steadfastness and strength. This is also the crest of one of the English Schroder families and one branch of the Pollocks so two Boys High headmasters are also represented by this banner. Named after the suburb of Pretoria from which some of the original dayboys were drawn. This design uses the rather obvious sun symbol, which has a long heraldic tradition and features in a number of African flags. Virtuous notions associated with this symbol include purity, prosperity and endurance. the Rose of England symbolises the role played by Britain in setting up the Pretoria College (forerunner of PBHS) and the original teachers and headmasters who came here from England. 1998 Mr Justice Edmund Cameron High Court of South Africa Valediction. The school’s museum is housed in the east wing of the main buildings. It was expanded and completely refurbished in time for the centenary of the original buildings in 2009. The first room of the museum covers the origins of the school in the Staats Model School which evolved into the Pretoria College, a school that relocated to the present grounds in 1909 and amalgamated with the Eendracht School to form PBHS. Artefacts, flags, photographs and models are all used to tell the story from the time of the Anglo-Boer War (including the use of the present grounds as a British field hospital) up to the 1950s. A comprehensive collection of school uniforms is displayed together with full size reconstructions of sections of a typical early classroom, science laboratory and woodwork room. The original Danny Swart statue, carved from wood, forms the centrepiece of this room. The second room of the museum is based on themes and includes displays on World War One; the inter-war years; World War Two; the school badge; Walter Battiss; schoolboy pranks (and punishments); the Cadet detachment; the Pipe Band; Music and Musicals; the evolution of a multi-cultural school; aspects of the “koppie”; changing technology; depictions of the school in art; life in boarding houses and sport in the school. The museum facility includes an archive room in which is catalogued and stored a large collection of photographs, documents, programmes and school magazines. The museum can be visited during school term between 09:00 and 12:00 daily, Monday to Friday. The curator is Mr Keith Gibbs. Donations of any items relating to the history of the school, particularly the earlier decades, are welcomed. He did at least have a building in the form of the Staats Model School, built in the 1890s in President Paul Kruger’s erstwhile ZAR (Zuid Afrikaansche Republiek). Closed at the onset of hostilities in 1899, it served for a while as a prisoner of war camp for captured British officers (mainly from the campaign in Natal) and included among its internees none other than Winston Churchill who was captured as a war correspondent. His successful escape from the building added a colourful chapter to the history of the building. The Staats Model School is preserved as a national monument today and still has relics of its former inmates in the form of murals and an incomplete escape tunnel. Charles Hope set up a small school that started classes in mid 1901. PBHS regards him as its founding headmaster and bases its annual “Founders Day” on the date he taught his first lesson. For a year, the school existed as school for both boys and girls. In 1902 the girls were provided with their own building and this is how the sister school of PBHS came into being, namely Pretoria High School for Girls. Charles Hope left for Johannesburg (where he established a further school) and the first of two headmasters brought from England, replaced him. Harold Atkinson had studied at Cambridge and taught at Rossall School in Lancashire. The school he inherited in central Pretoria had 84 pupils. The original colours of the school (blue, brown and red) were adopted for hat bands although there was not yet a uniform. Atkinson’s successor was John Acheson who played an important part in pressing for new grounds and buildings for the school that had by this stage, become known as the Pretoria College. The head of education in the Transvaal Colony, Sir John Adamson, motivated for the granting of money to build a new boys’ school and in 1908 a sum of £36 000 was approved by the colonial secretary, Jan Smuts. 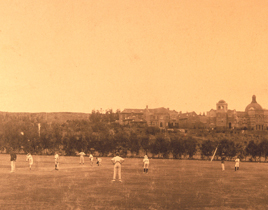 Land was set aside on the town lands to the east of Pretoria, then very much on the outskirts of the town, for three educational institutions, these being a boys high school, a new site for Pretoria High School for Girls and the newly-established Transvaal University College (“Tukkies”), today the University of Pretoria. The land allocated to the then Pretoria College comprised about one hundred acres running partly up the side of a ridge. It had previously been used for a British army hospital camp. Plans for the new school buildings were drawn up by the chief architect of the Public Works Department, Piercy Eagle. The original buildings comprised a main central building (with classrooms, offices, a library and a school hall) and the two boarding houses, one to the west and the other to the east of the main building. Construction of the buildings began in 1908 with locally quarried mud-stone and locally made bricks (from Kirkness brickworks) combined with Free State sandstone to create the pleasing buildings that are still the attractive centrepiece of the school today. The foundation stone was laid by the Governor General, the Earl of Selbourne, in July 1908 and construction of the buildings was completed early in 1909. The new school buildings were opened in April 1909 by Jan Smuts with Mr GL Thomas as the acting headmaster. The school badge and the school magazine (The Pretorian), both date from 1909. The boarding houses were named after ministers in the Transvaal government: Rissik House after Johan Rissik (Minister of Lands) and Solomon House after Sir Edward Solomon (Minister of Public Works). All boarders were housed in Rissik House for the first months before the “Solomonites” moved to their own house. In 1910 the school changed its name to Pretoria Boys High School when the Pretoria College amalgamated with the Eendracht School. This move paralleled the establishment of the Union of South Africa in the same year and was motivated in part by a political imperative: to promote the reconciliation of English and Dutch-speaking South Africans in the aftermath of the bitter war recently fought in the region. The school would remain dual medium for over a decade. The first headmaster of the school (under its new name) was William Hofmeyr who would serve from 1910 until 1934, the longest term yet of a PBHS headmaster. He instilled much of the discipline for which the school would become famous.